Dogs love to chew, and chewing is a perfectly normal behavior. 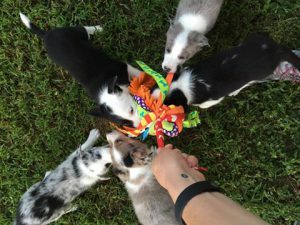 Puppies chew when teething. Dogs chew for stimulation, to relieve anxiety and just for fun. 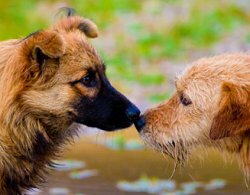 Left to their own devices, Dogs may choose to chew sticks, furniture or your favorite pair of shoes. 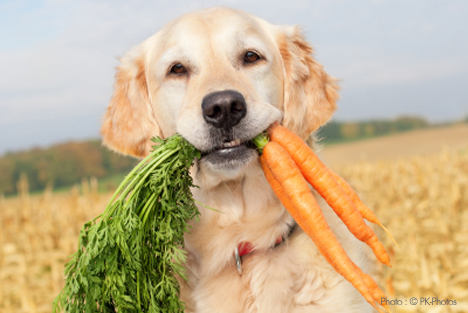 Whether or not you like it, your dog would benefit from chewing on things that are safe and healthy. 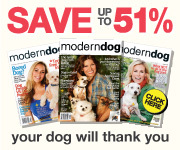 There are Three main categories of dog chews that are marketed for your best friend. Animal parts that are treated like rawhide and pigs ears. Lets start with Bones and Antlers. 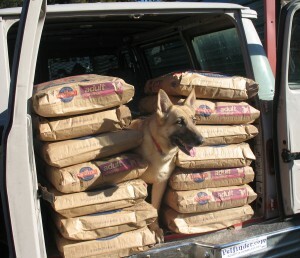 Beef leg bones can cause entrapment. Face it, Dogs have been chewing on Raw bones since, well, since they were wolves. That being said, our breeding of dogs to suit our needs and purposes has given some dogs an advantage or disadvantage of chewing on bones. Bones that we offer our dogs have also changed and it would be unlikely that a wild dog would find a nice slice of a cattle leg bone to chew on. Bones slices can be dangerous and one of the biggest mistakes dog owners can make when choosing any kind of chewing “toy” for their dog is that they provide bones / chews that are to small or become too small quickly. Hollow or marrow filled leg bones can also splinter and cause damage to your dogs mouth, throat and/ or intestinal track. If you are dead set on giving your dogs cattle leg bones you are best to use joint or “knuckle” bones as they are less likely to entrap your dogs jaw and are a little harder to splinter. Ram/water buffalo: of these choices, Ram horns are the newest on the market. Not really antlers as they do not naturally shed, Ram horns are more like bones, and are known to splinter. Moose: Moose Antlers are denser making them the hardest and the ones that I prefer to give my dogs. Like Deer and Elk, Moose antlers are naturally shed and consist of pure calcium. Moose antlers get worn down as the dog chews on them. I have never had one break or splinter. 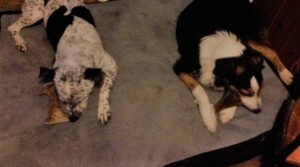 If you want your pets new Antler to last longer, purchase large pieces and not the “splits”. All antlers that are split, are easier for the dogs to destroy. There are quite a few different brands of these Hard Rubber bones. Some dogs will not have anything to do with them, others love them. Because I live in a multi dog family, I find that these can be left around and are unlikely to cause any conflicts among the pack. I have also found that the brand Nylabones are the ones preferred by my dogs over any generic brands. It is likely that my dogs like to chew on these because when new dogs are first introduced to my house and the pack, I encourage the chewing on these by replacing any inappropriate thing the new dog is chewing on with a nylabone. Nylabones hold up under heavy chewing, wear down, and do not splinter. Stick with types that are molded into one piece and avoid ones that are attached in halves, as they can be chewed apart leaving small attachment pieces that can be swallowed. 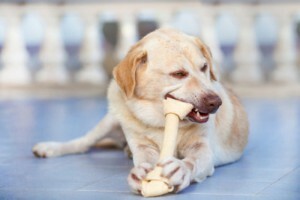 Rawhides can be eaten and should be considered as part of your dogs diet if he is eating them. 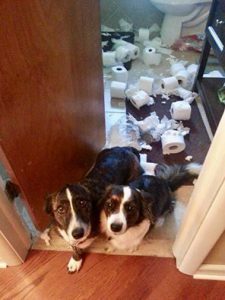 Of all the things that you can give your dogs, this category can be the most dangerous. Due to the amount and type of preservatives that some manufacturers choose to use in the making of these products, pet owners should look carefully at labels. Often these products are bought by bulk in stores and sold with out labels. Formaldehyde is one of the key preservatives used and when fed to dogs continuously can cause some serious health problems. Because these things are almost always completely eaten, they should be considered part of the dogs daily caloric intake / diet. Please only purchase rawhide , pigs ears and bully sticks in packaging that allows you to see the ingredients including preservatives used. Rawhide, Pigs ears and Bully sticks are made from dry, dehydrated animal parts. During the chewing process, it is common for large pieces to be chewed off and be swallowed, and due to the preservatives, the digestibility of these products are poor, therefore these products should only be fed in moderation and under supervision. 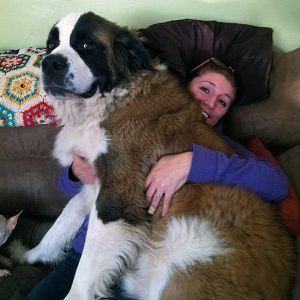 Purchase the largest size that you can for your dog. Never give your dog a chew that can cause damage to your dogs mouth, throat, teeth or digestive system. Always remember to monitor any toy that is given to your dog to chew and when it gets small enough to be a hazard, TAKE IT AWAY and replace it. If you have more then one dog, Always monitor them when given any new toys. Read reviews and packages. Know what you are feeding your dogs. Watching your dog enjoy a good chew, knowing that it is a natural behavior, that allows him to clean his teeth while releasing energy, should be a healthy and enjoyable time. If you have a favorite chew that your dog loves, I would love to hear about it! Or if you have questions, please leave me a note and I’ll get back you as soon as possible. 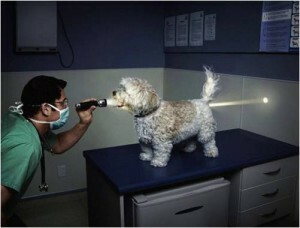 May All Your Dogs Be Healthy! We are Beings of Light. Light enables us to read this page by reflecting back to our retina. 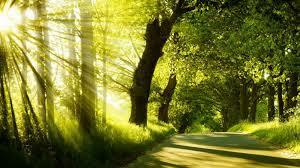 We Breath in life giving oxygen, produced by plants using the energy of the sun. We absorb essential nutrients like vitamin D and we “tan” due to the light of the sun and a chemical reaction in our cells. This amazing relationship with light is something we share with most living organisms on this planet and as a result we tend to rely on light for energy, information and guidance. It’s no wonder ancient civilizations worshiped the Sun as a life giving, god-like being. Had the sun been smaller, or further away, it is likely none of us would be here. This process of how our bodies react with light is known as photobiomodulation. In 2015, the term Photobiomodulation Therapy (PBMT) was indexed to the National Library of Medicine as the term to replace the existing records of low-light laser therapy, Biostimulation, Cold/Cool Laser, Low Level laser therapy, Soft Laser and Low Power Laser Therapy. The word L.A.S.E.R is an acronym for (Light Amplification by Stimulated Emission of Radiation), and is distinguished from other light sources by its coherency (ability to stick together) creating a beam of light in which high energies are concentrated. Laser Light Therapy is a form of photo-therapy (treatment with light) used to stimulate tissue repair and provide pain management. How Does Low Laser Light therapy Work? The laser uses specific bands of light to stimulate tissue at and below the surface of the skin. After an injury, the body needs cellular fuel, known as ATP, to heal. With low laser light therapy, a low-level laser directs energy through the skin and to the injured cells. Cells then harness this energy and convert it into more ATP. The more ATP the body can produce, the faster the cells can repair cellular damage. Additionally, this injection of cellular fuel helps tissues eliminate the inflammatory substances that cause pain and lead to scar tissue. This modality of medicine is quickly becoming one of the most popular high-tech treatment options for safely and naturally accelerating the body’s natural healing process after injury. Recently, with better understanding of the effects of the different wavelengths, technology has evolved and third generation devices are now available and are proving to provide a higher level of safety, with better results, in a portable, powerful, over the counter unit. Laser technology began with Albert Einstein, who, in 1917 proposed that electrons could be stimulated to emit light of a particular wavelength, But it would take nearly 40 years before scientist would be able to prove Einstein correct and begin putting lasers on the path to becoming the powerful versatile and universal tool they are today. Fast forward to today, and lasers are an important part of our daily lives. Lasers are used in CDs and DVDs, scanners, fax machines, fiber optics, engraving and cutting and our cell phones, basically our entire electronic world is connected to lasers. Lasers are used in LASIK eye surgery and used in Hospitals around the world for easy and safer surgeries. But not all Lasers are the same. Photobiomodulation does not induce heating in tissues like surgical lasers, remember it is all in the photochemical reactions of the certain wavelengths of light with our cell membranes. Compromised cells respond better than healthy cells to light energy allowing these brief treatments of low level light to enhance wound healing and tissue regeneration, reduce inflammation and treat chronic pain. According to the Food and Drug Administration or the FDA, Laser products are classified on the basis of the highest level of laser radiation to which human access is possible during operation only. Lasers are also classified using physical parameters of the laser, power, wavelength and exposure duration, and is based on the laser’s potential for causing immediate injury to the eye or skin and/or potential for causing fires and/or burns from direct exposure to the beam or from reflections from diffuse reflective surfaces. The higher the class, the more dangerous the Laser. The FDA recognizes four major classes ( I to IV) of Lasers including three sub-classes. In the beginning Laser technology was quite complicated. Is this the correct wavelength? Light is composed of photons. A photon can act like a particle or a wave at the same time and travels at the speed of light. The energy of a photon is directly related to the frequency of its wavelength. The shorter the waves of light, the greater the energy transferred.. The Intensity of the light determines how many photons strike a given surface. The higher the intensity, the greater the number of photons transferred, thus the greater amount of energy transferred. Yes, it used to be quite a mathematical formula to set a laser with the needed power to the proper wavelength to get the desired results. One had to be part doctor and part mathematician to be consistently successful with a powerful laser. It is no wonder that many professionals stayed away from early lasers and the dangers that they presented. Thankfully, technology has evolved and caught up to the Science. Scientists have been successful at pinpointing the exact wavelength and power needed to help damaged cells regenerate and repair, and are able to use and understand how different wavelengths work best for different injuries. 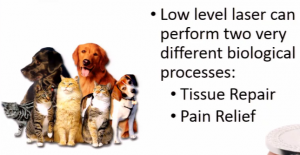 With this new understanding of how best to use lasers for healing, new lasers have been developed that offer all the power of a class IV Laser with the safety of a Class I, making cold laser light therapy practical, safe, affordable and available to anyone who wants to improve their own or their pets healing process. Lasers of old were considered Constant Wave lasers (CWL). New Developments in technology have now created Super Pulsed lasers (SPL). Some CW laser manufacturers now claim to use pulsed technology by gating the beam with a shutter, chopping it on and off and yes these CW lasers can still produce beneficial effects, but they cannot compare with the density, depth of penetration and patient safety made possible by true Super Pulsed lasers. Super Pulsed Laser; Technology comes of Age..
With higher Photon density, True Super Pulsed lasers enable deeper penetration of tissues, up to 5 inches deep, and Super Pulsed lasers produce a high peak impulse of intense light “flashes”, allowing for quicker absorption at the cellular level which increases the energy available and stimulates production of new ATP, leading to optimal rapid pain relief and accelerated healing. With a Super Pulsed laser there are no damaging thermal effects in the tissues allowing for a Class I FDA safety clearance. With Light being such an important part of living cells, it is about time the use of this energy became available, and Just like improvements in technology across the board, lasers have evolved to become a true option for treating injuries, both chronic and acute. Chiropractors, oral surgeons, and veterinarians are among the many professionals using and praising the results. Professional sports teams have been using the efficiency of laser technology for years to keep their players on the field. The key to a successful therapeutic dose of laser energy is achieving the right combination of power, wavelength and time, allowing proper penetration, without causing harmful effects to the cells or creating thermal effects that do more harm then good. Want to learn more about Photobiomodulation and how it can help relieve your pain? 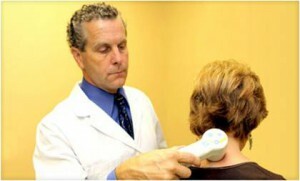 click here for my review on Multi Radiance Medical laser.